Talya is a delta girl who grew up making mudpies on her family’s cotton farm in Mississippi County (Northeast Arkansas). After thirty years as a commercial banker in Dallas, she returned to the state she loves and now lives in Fayetteville with her husband, John, and two miniature schnauzers, Lucy and Annabelle. Talya is a regular contributor to Delta Crossroads and Front Porch Magazine. Her work has been published in Arkansas Review, Postcard Shorts, and The Write Life. Talya’s love of food, farming, and nature is evident on her personal lifestyle blog, Grace Grits and Gardening. She loves to cook and believes most any dish can be improved with a side of collard greens. The Accidental Salvation of Gracie Lee, scheduled for release January 28, 2016 from SYP Publishing, is her debut novel. But Gracie’s life was far from predictable. Growing up in the cotton fields of Arkansas, Gracie saw her life as one of heinous misfortune. The victim of the meanest girl at Savage Crossing Elementary School and the daughter of a controlling, mean, alcoholic father, Gracie did her best to keep quiet when life’s injustices fell into her lap. But there were times when it was all just too much. It was during those times when Gracie’s adventurous spirit led her to explore the mysteries of the abandoned grey house down the road or to eavesdrop on her mother’s party-line phone calls. This was how she discovered the seriousness of her father’s medical problems and fueled her Nancy Drew tendencies. Her only outlet was the invitational time at church when she held her weekly “talk” with Brother Brown. The Accidental Salvation of Gracie Lee is one of the best books I have read in a long, long while. Integrating themes of substance abuse, lessons in morality, and timeless fears of coming of age, author Talya Tate Boerner has excelled in the brilliance of bringing characters to life in her debut novel. The storytelling rarity of multiple story lines is effortlessly successful in this vividly told tale. Boerner utilizes all of the senses to weave a story filled with human emotion so palpable that the reader is forced to step away from the pages in order to digest the full impact of her words. I enthusiastically applaud this story and the future of this author. Set in the 1970s, The Accidental Salvation of Gracie Lee is the story of Gracie Lee who sees the world in a different and innocent way. She is troubled by the turmoil in her family, especially between her mother and father. She reads people very well in her own fashion and wonders who lives in the beautiful gray house. Gracie ponders about a number of things, including the plight of the soldiers fighting in the Vietnam war. She fantasizes about what it would be like to be the daughter of Elvis Presley and not the daughter of her harsh and moody father. Yet Gracie cares about her own father enough to go up to Brother Brown to talk about the problem in her family because of her father. Gracie has her adventures and makes great decisions, but yet in a simple way, Boerner has managed to create magic with her marvellous plot. The Accidental Salvation of Gracie Lee by Talya Tate Boerner is a marvellous and a very thought provoking read. The introductory chapter captivates the reader immediately and the little fears of the protagonist touch the very core of the reader's heart. The Accidental Salvation of Gracie Lee is candid and to the point. Descriptions are few and not tedious to read as Boerner has handled that very well. This book is a page turner and the characters in the book make one want to savour them, for they are too real to be overlooked. All in all, a great narrative. Congratulations to author Talya Tate Boerner. The Accidental Salvation of Gracie Lee by Talya Tate Boerner is an engaging story of an inquisitive beyond words young girl named Gracie Lee, her life, and her bizarre thoughts. Born and raised in a dull town where hardly anything exciting ever happened, Gracie Lee always felt unfulfilled by the monotony of her life. Her soul craved for more and she refused to accept that this was the kind of life she was forever destined to live. Unlike other little girls her age, Gracie's over active mind compensated by conjuring all sorts of thoughts and worries - like how Johnny Cash became rich and famous, why the man who lived in the gray house was depressed to suicidal levels, or why she was born to her parents and not to Elvis and Priscilla Presley. Her condition was further exacerbated by her father's drinking problem, which always had everyone walking on eggshells. Gracie's thirst for knowledge and her ever so inquisitive mind soon lead her into real trouble, but in the process she will also touch the lives of others in the most profound ways. The main character of Gracie Lee is a perfect combination of pure childhood innocence and an old soul that is wise way beyond her years. Talya Tate Boerner blended these contradicting traits into one deep, humorous and engaging character. The workings of Gracie's extraordinary mind were quite fascinating; I could feel the wheels in her head turn as her mind took her to places unimaginable for someone her age. Talya Tate Boerner pulled this off so perfectly, giving us a character of incredible depth and charm. The setting of the story is yet another thing that came alive. The somber feeling and cloud of anxiety and uncertainty came out clearly. 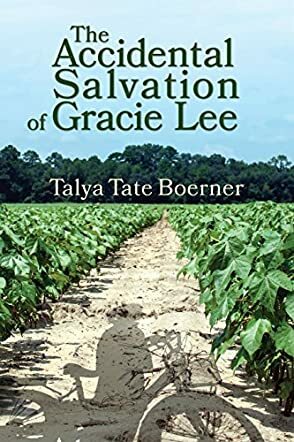 The Accidental Salvation of Gracie Lee by Talya Tate Boerner is a deeply moving story guaranteed to tug at your heartstrings. With humor and pathos, Talya Boerner writes a beautiful tale of life in a farming town in Arkansas, with all its unique characters and events seen through the eyes of an intelligent, questioning child, Gracie Lee. You'll love Gracie Lee, as I do now. Thanks, Talya, for Gracie Lee!